So. North Shore City Council is pressing ahead with the proposed National Ocean Water Sport Centre (NOWSC) on public land adjacent to beachfront reserve. There has been one public opportunity to see what is planned. That was on Thursday 29th July. The handout there answers the question: "Was the public consulted about this project...?" 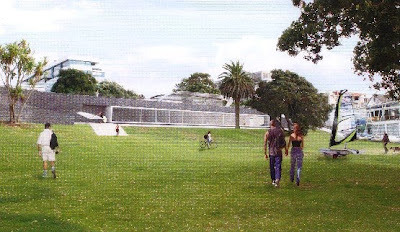 with this answer: "While Council has complied in full with Local Govt Act requirements that excuse councils from consultation due to the transition to Auckland Council, the timing of this proposal has restricted the ability of council to consult fully on this matter...."
The picture above shows an architect's idea of how the Centre might look like above ground, as the idea is the rest of it is underground, with windows and entry ways directly onto the Takapuna Beach Reserve. This public amenity is precious, based on a chunk of beachfront reserve paid for at great cost by the Council with ratepayer dollars. Takapuna has a low provision of public parks and beachfront reserves, compared with other Auckland coastal suburbs. This land, how it is fronted and used, becomes more important. If it is taken for another purpose, or alienated, the public will be the loser of this valued opportunity of enjoying Takapuna Beach without being pressured by commercial activities - even if those activities are associated with an ocean sports school. 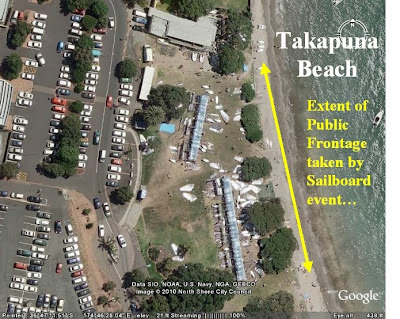 This aerial photo shows how much of Takapuna beachfront reserve was taken up by a SailBoard Event run out of Takapuna Boat Club. There are structures on the reserve, trailers pulled up, cars parked. Sail boards all about. I estimate about half of the reserve area and amenity was taken by this event. However the public are prepared to accept this on a temporary basis. Event by event permission being given for some times in a year. Strict conditions. But not a permanent facility. Not incurring public opportunity cost. There is no way to offset it. (3) The third lost opportunity embodied in the NOWSC proposal is that Takapuna risks losing the opportunity of transforming its waterfront space to something that is really stunning by good urban design. Stunning for the public, for the town centre, and for visitors. These next few pictures show the urban design of recognised Sydney beachfronts. The urban layout is exemplary. We need to learn from what the Aussies do well. Look at this close up of Manly Beach front. You can see how the beach edge of the road is not developed. It is for pedestrians, and some car parking. It is purely public. As is the beachfront reserve. As is the beach itself. Commercial activity - retail and food - is on the other side of the road. Along with verandahs and lanes. The road is the separator between public and private. And here's a closer view. There's no way Manly Beach residents would allow half its beach width permanent rights for Year round Ocean Sports education for NSW or the whole of Australia. Nor should that by happening on Takapuna Beach. 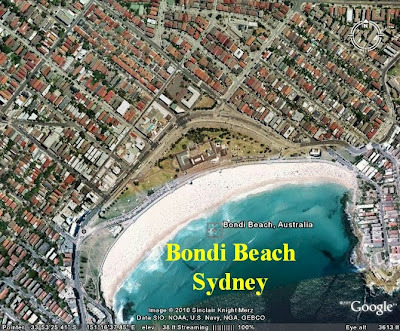 And here is Bondi Beach. You can see a similar development pattern to Takapuna generally - ie low rise, development, grid streetscape, beachfront reserve, beach. 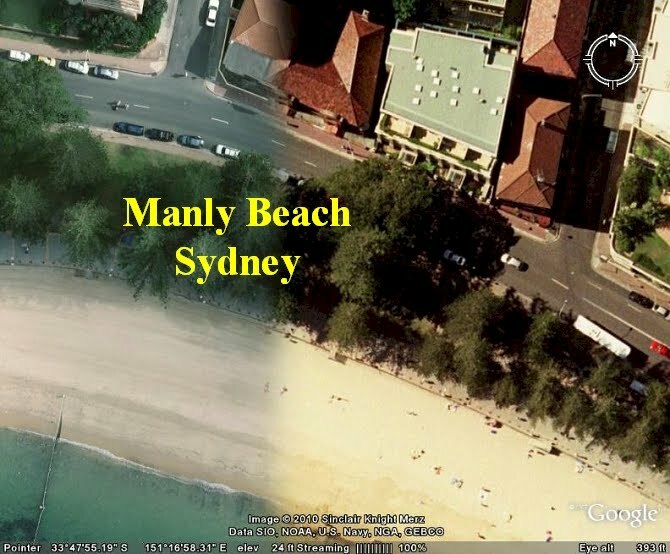 But Bondi has obeyed the same urban design rule as Manly. The street between the beach and commercial area is developed on one side only. The rest is public. Here's one end of Bondi Beach in closer view. While there's the odd changing area on the reserve grass, all the way from the shop fronts to the waves is public. Pure and simple. And that is the case for the whole length of the beach, apart from a facility in the middle which is a public facility anyway. 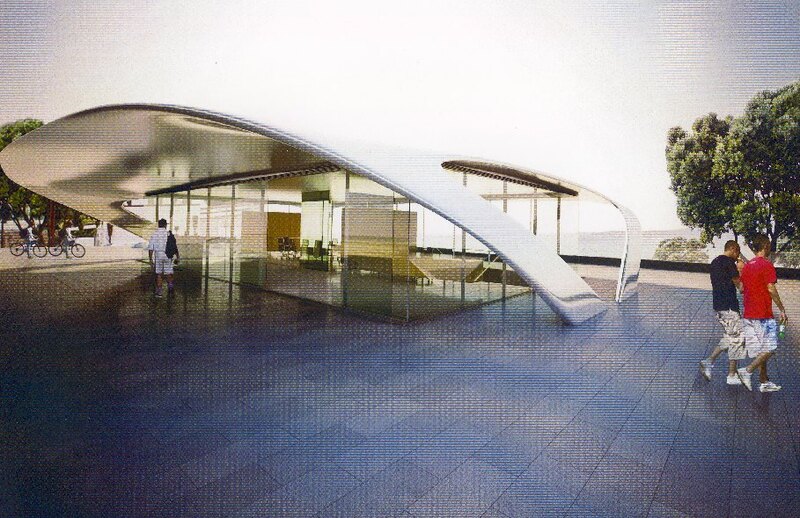 But here is an artist's impression of what is proposed in and on Takapuna's Beachfront Reserve. The squares you can see are plate glass windows - eight or ten of them - fronting right the way along almost half of Takapuna Beachfront reserve. A bit like the most expensive house you can imagine, having its windows and deck right on and up against and in your face on the public reserve. This aerial/map shows the footprint of the NOWSC proposal. 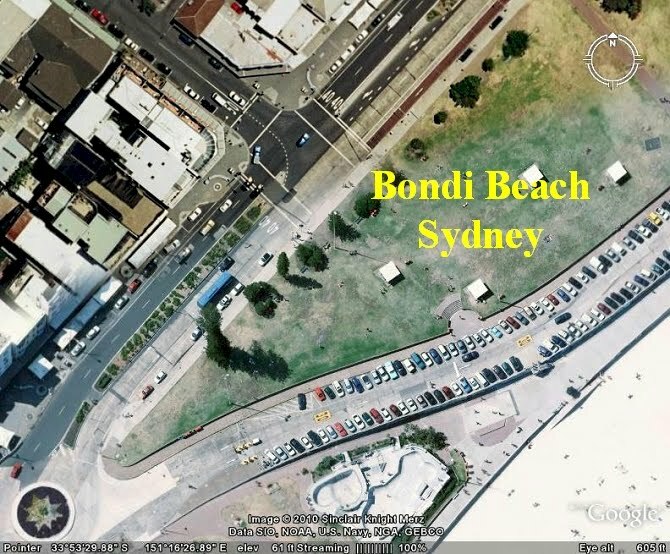 It is a very extensive area - most of it underground, with the proposed observation deck above ground on the beach side of the footprint. This aerial shows the proposed realignment of the road to carry traffic and to provide some parking. 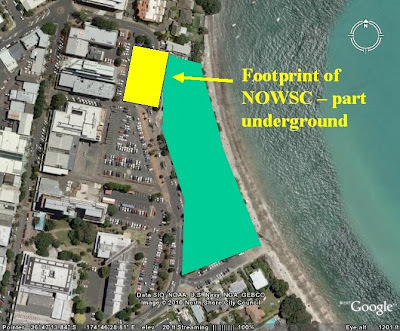 It is also proposed that some public walking access be over the top of NOWSC, though the detail of that is unclear. The road shift is needed to make way for NOWSC. It is another indication of the size and demand of NOWSC pushing public amenity to one side. 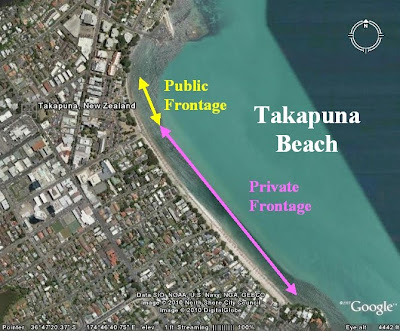 It also comes at a huge opportunity cost to Takapuna. 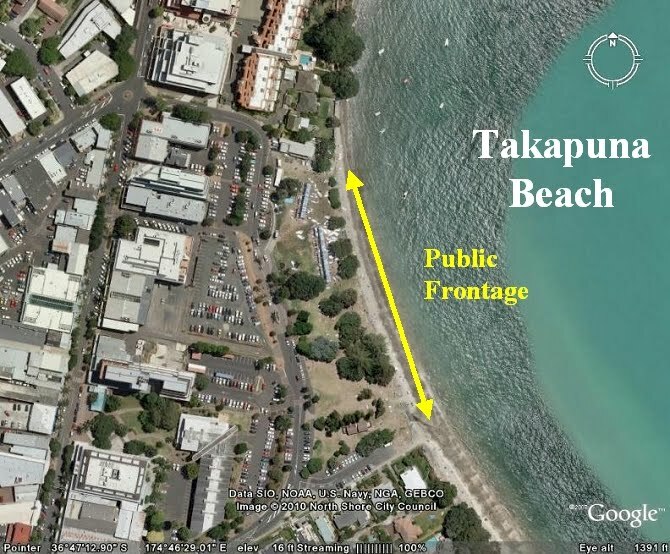 Let's take a second look at the Takapuna beachfront reserve. Here it is shaded in green. 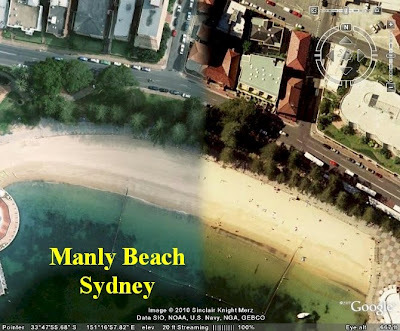 Undeveloped at the moment, and with street space (street reserve) that can also be taken to expand beachfront reserve, or used to deliver great urban design, and a frontage and amenity like Manly and Bondi. The first building development needs to front the side of the street opposite from the beach and away from the beachfront reserve. So shoppers or whatever can look across the street, across the reserve to the sea and Rangitoto. Following the exemplary urban design of Bondi and Manly. That is the economic and amenity opportunity at risk. It risks being lost, by instead giving in to the enthusiasm of NOWSC. The next stages of ideal and exemplary development could proceed in time. With laneways extending up into Hurstmere Road, and access laneways between the new "yellow" blocks and the rear of the buildings built facing Hurstmere. Let's not lose any of those opportunities. And by the way, I understand there are some great potential spots for NOWSC on Regional Parkland. Sure they don't have hotels, but then - we only have one Takapuna. The price and opportunity costs are too great. Shed 11 Queens Wharf - RIP? Here's a great photo of Queens Wharf in the mid 1970's. You can see that there were 5 sheds on the wharf then - quite cosy up to each other. 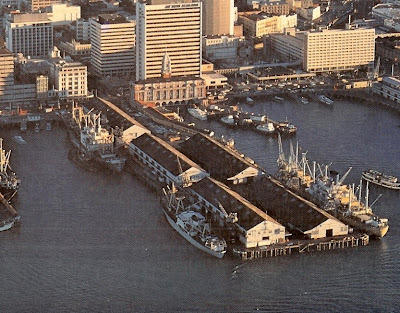 You can see that Shed 11 (the one at the end today) has a verandah facing into the centre of the wharf, as does its partner single-story shed next along toward the ferry building. 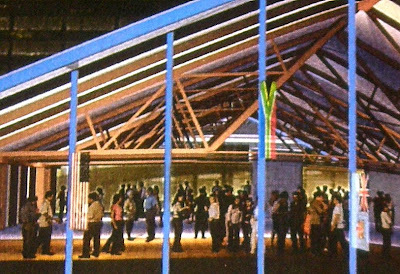 I know some architects think that the best place for Shed 11 is opposite Shed 10 - where one just like it stood in the 1970's. Interesting idea. 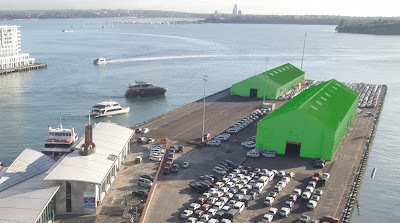 This would free up the whole end of Queens Wharf. I won't say what for, but in the meantime that's the place that's been set aside by Government for its RWC, Party Central temporary plastic structure (aka tent, slug, etc). There are also view that Shed 11 might go somewhere entirely different - to a marine area, even to house Maori waka and waka repair and construction on land at tankfarm. An interesting idea that one. The roof trusses are still like new it seems, and that's kauri sarking that lines the roof apparently. Acres of it. Probably a hell of a lot cheaper than carefully dismantling it, piece by piece marked up, trucked off site, stored somewhere sensible, then rebuilt. Don't ignore these fantastic iron joints. Unrepeatable. Outside, Shed 11 does look neglected. And it has been. But it does stand proudly on the wharf, and it is the last surviving relation to Shed 10. There have been seem imaginative reuse designs put forward for Shed 11. If it is going to RIP somewhere, why not alongside Shed 10? At least until we can figure a better and more certain place for it. And I don't mean just for the sake of the Shed itself. It's all about re-use. So we need to get creative about that. No more bananas, so what then? Waka storage and maintenance and rebuild? Other wooden boat repairs and rebuilds? Something. ...paper discusses the issues around housing affordability in the context of increases in urban density, with consequent effects on resource pricing of land, industry profiles, residential density, employment participation and incomes. The paper is written in reseanably dry academic tones and notes previous work in relation to housing affordability by one Arthur Grimes et al, known for their strident criticism of controls like the Metropolitan Urban Limit, and their economic arguments that the MUL is one of the single most influential causes of housing unaffordabiliy, by constraining the supply of land. Sanderson's research looks at the effect on housing affordability - particularly medium density housing provision in town centre environments - of the fact that medium density homes use less land/home than the more life style homes seen at the edge (and of less expensive homes in new subdivision at the edge which nonetheless are representative of the the 1/4 acre pavlova paradise "ideal", and of the fact that people who live close to, or in town centres benefit economically from agglomeration benefits and reduced network costs (including travel). These observations do not provide incontrovertible proof that in these areas of higher density housing is more affordable, but they do indicate that there is a need to investigate further these behaviour phenomena, in the interests both of housing affordability and of urban and economic development in a broad range of our urban centres. 1. The land price per resident is generally lower because the density increase is greater than the land price increase. networked infrastructure declines per person; and the opportunity for using active transport modes (walk, jog, cycle) in a range of journey purposes increases. (In most urban areas about 6% of the travel-to-work journeys are by active modes whereas in inner Wellington and Auckland the figures in 2001 were 50%-62%.) 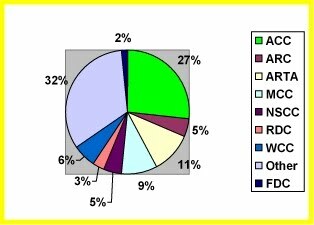 For other journeys, public transport is more likely to be a viable option in the more-dense areas. I hope that more research is done exploring these matters further. It is essential that the narrowly focussed economic analysis of the Grimes, Wendell-Cox, Pavletich, is set aside through broader based analysis that takes account of all costs and benefits of different housing options and alternatives. 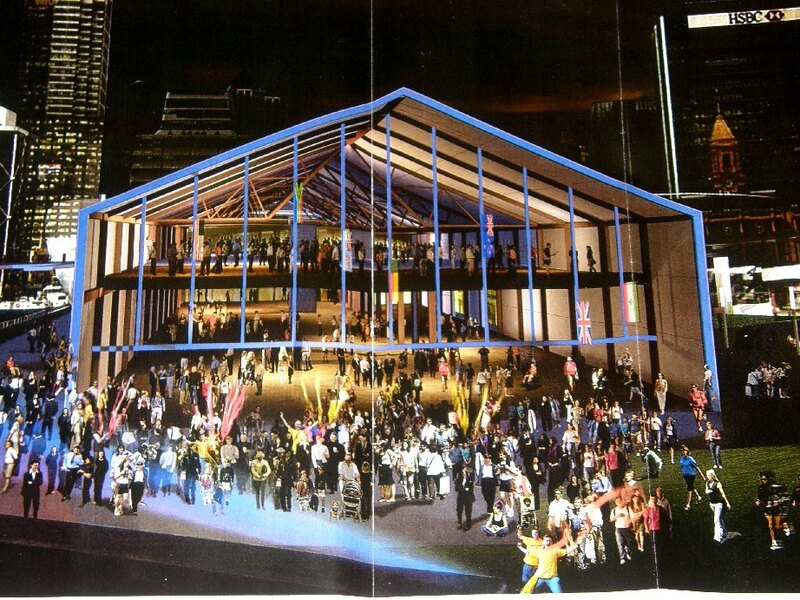 Friday's joint decision by ARC and Government to keep Shed 10, build a temporary structure alongside, and deliver Party Central Rugby World Cup obligations on Queens Wharf is a classic political compromise. Two political faces get saved, the media feeding frenzy eases, the public relaxes. The Fan Zone needs 6000 square metres of floor space apparently. The two floors in Shed 10, plus the floor area of Shed 11 total 6750 square metres. More than enough. The locations of these sheds is perfect for the two cruise ships that will temporarily park on Queens Wharf, and house 3000 international fans. They can house and store logistics needed for the ships, as well as providing great weather proof environments for fan zone spaces. I guess I should not shed tears for Shed 11. Instead be grateful that Shed 10 has a stay of demolition. It is good that there will be no rush to do Shed 10 up, nor rush to extend it and add hasty adaptations. The opportunity presented by Shed 10 and the rest of Queens Wharf remains, and needs to be protected. Come on Historic Places Trust get that heritage registration finished. Among the more visionary and thoughtful planning documents that have been prepared during the current term of the North Shore City Council is its consultation document entitled: "Takapuna Strategic Framework". That translates into 6000 new homes for 12,000 new residents and an additional 5000 jobs over that period. Auckland-wide, the population is expected to increase from about 1.4 million to about 2.3 million by 2051. The Adequacy of Auckland Region's Residential Land report back in 2008 said the North Shore could soon run out of land for housing, including intensive development. The Takapuna strategic framework discussion document tackles growth and change possibilities over the next 30 years. It examines how they might affect the future make-up, look and feel of buildings, streets and other public spaces. It looks beyond the existing centre and considers the longer term potential for business redevelopment along the Takapuna-Barrys Pt-Smales Farm corridor leading to the central spine of Wairau Valley. The sequencing of this proposed development will be heavily influenced by whether an additional harbour crossing materialises and whether it includes a northern rail link. Council officers say the framework will provide a direction for more detailed precinct planning and for the infrastructure and facilities needed to support the wellbeing of local businesses and residents. The document divides Takapuna into eight precincts – central and beachfront, central west, northern Hurstmere, Upper Shoal Bay, Anzac west, Barrys Pt Rd, Taharoto and lake edge. They say previous studies on Takapuna have been limited to the commercial and shopping core. The new draft covers areas up to Northcote Rd in the northwest, the southern edge of Lake Pupuke, Earnoch Ave in the northeast, the beachfront and Lake Rd, Esmonde Rd and the northern motorway. North Shore mayor Andrew Williams says Takapuna has huge potential in its central business area and wider precincts to further develop into the thriving southern hub of the Shore...."
Among the documents available on the council website that inform this planning document is the: Takapuna Strategic Review research. Not sure why I can't find a link on the website now to the actual Strategic Review document. Feedback was requested, closing 9th July 2010. When I was a North Shore City Councillor, it was hard to get planning for Takapuna to extend beyond the shopping and beachfront precinct. So Barrys Point was left out, so was half of Anzac Street, Taharoto, links with Wairua Valley, let alone links with Albany and the Auckland CBD. So this document is an expansive breath of fresh air. I attended a public meeting at Takapuna where James Lundy of Common Ground had been asked to present his urban planning response to issues and challenges that were set out in the Takapuna Strategic Framework document. This was quite a good way to handle a difficult communications problem, though it meant those in the audience were responding to one man's set of ideas, or to the written document itself. Questions outside Mr Lundy's presentation were handled by David Sanders for NSCC. It was an interesting afternoon. And it was apparent that Takapuna residents are only at the start of what should be a long and thorough process. There are no shortcuts. In my experience of Auckland planning, it has only been Waitakere City Council that has made appropriate efforts at engaging its communities (including residents, shoppers, public service providers, land owners, developers, transport users) through charrette processes in the development of land use plan changes for places like New Lynn. So, hopefully, sudden decisions are not made on the back of this start by North Shore City Council - changes that would preclude other more thoughtful and long term strategic plans. I understand that the Hon Murray McCully is championing both of these projects in the background, and that significant discussions have occurred with North Shore City Council and other interested parties. Possible Government money is on the table. Partnership discussions are happening in cofidential session. However little information is in the public domain and designs have not reached the stage where necessary resource consents are being sought. Beware of Ministers bearing gifts! The Hon Murray McCully has put $10 million on North Shore City Council’s table in a deal to build an elite yachting school on Takapuna’s Beachfront. There’s talk of a joint venture between Council and Government. 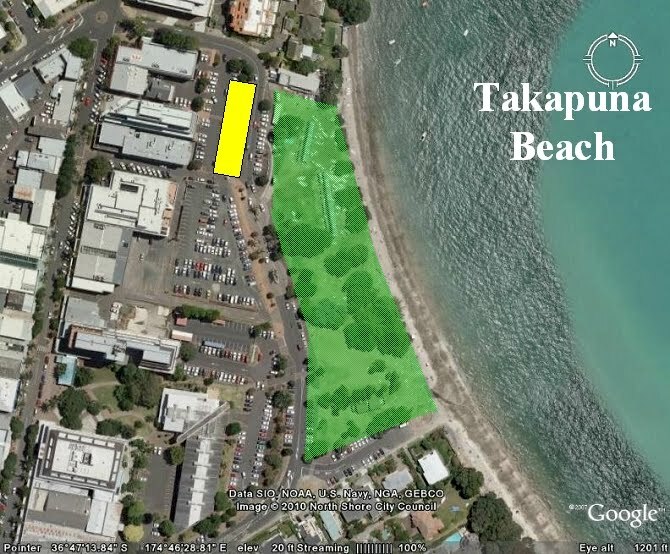 This might be a good idea, but should it be built on Takapuna’s precious and limited beachfront reserve land? 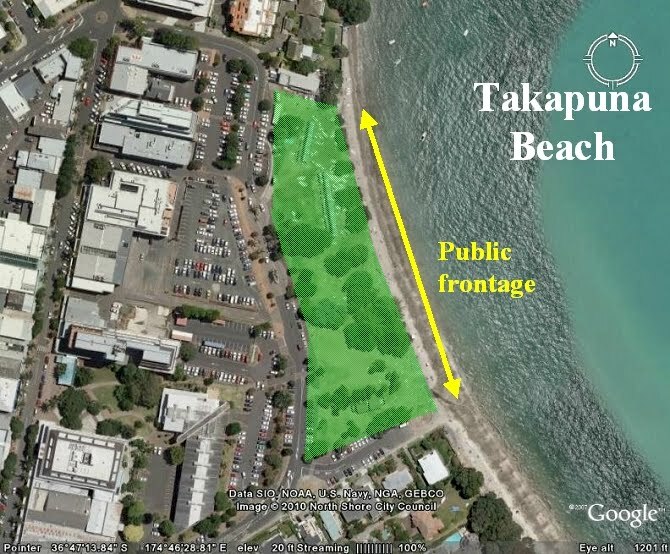 What about the public’s enjoyment of Takapuna Beach? The Auckland Regional Council got into a similar deal with the same Minister to turn Queens Wharf into an industrial cruise ship terminal. A deal which side-lined the public interest. Look and learn. Beware of Ministers bearing gifts that risk alienation or commercialisation of the public’s hard won harbour and coastal assets. A National Yacht School or Centre is a good idea. Just like a Cruise Ship Terminal. But where it goes and how it operates is a critical decision - especially if it is on land or space currently set aside as public reserve (which is what Takapuna beachfront land is). I am aware that there are proposals to place this Yacht School partially in the road reserve, and partially underground beneath the existing reserve. But it is an activity that will still occupy public land, public space that has not been set aside for any special activity. Takapuna beach has been a sort of tragedy of the commons on the North Shore, because so much of the beach frontage has been effectively privatised. Only a narrow public window exists onto the beach, and this needs to be protected from any sort of development. - Before the Harbour Bridge was built, these places needed ferry services, because there were few alternative transport options to get to Auckland CBD. That changed when the bridge was built. 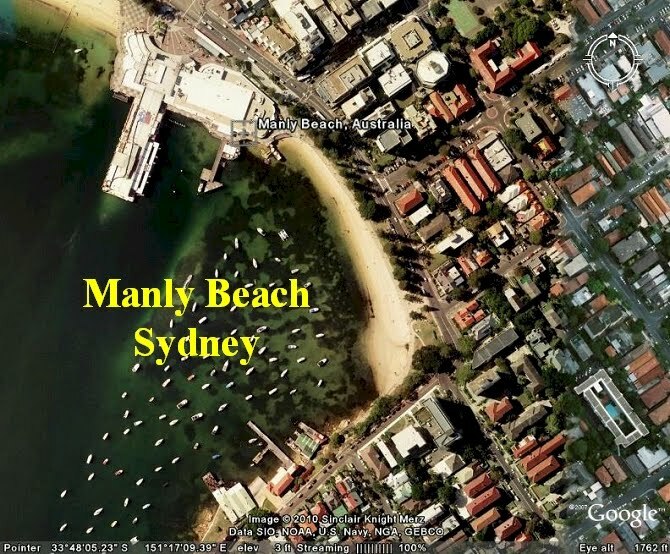 - Public attitudes to development on beaches has changed since the days of every beach having a wharf. The public want their East Coast Bays beaches kept free from development and activities which detract from the natural environment and peace and quiet. There will always be some who would like economic development opportunities that come with wharves, but I believe these desires are in the minority. - Ferry services need to justify their costs. That means that patronage needs to be at a level that justifies the costs of building wharves and landside servicves - including car parking. The Devonport ferry is successful in part because about 300 car parks are within a short walk of the ferry. That is not the case at Takapuna. Parking space is at a premium, and much of it is valued by recreational boaties. A Takapuna ferry service would not be economic, and car parking would be insufficient. - Significant investment has already occurred for Takapuna public transport services, especially to the Auckland CBD. These include the Busway, Takapuna Bus Station and buslanes, and Akoranga bus station. These services provide a 20 minute service between Takapuna and Auckland at nominal cost. Ferry from Takapuna to Auckland CBD would take about 30 minutes (takes 12 minutes from Devonport), and cost more than a bus trip. I will further investigate the Takapuna Strategic Framework process. And report further here. 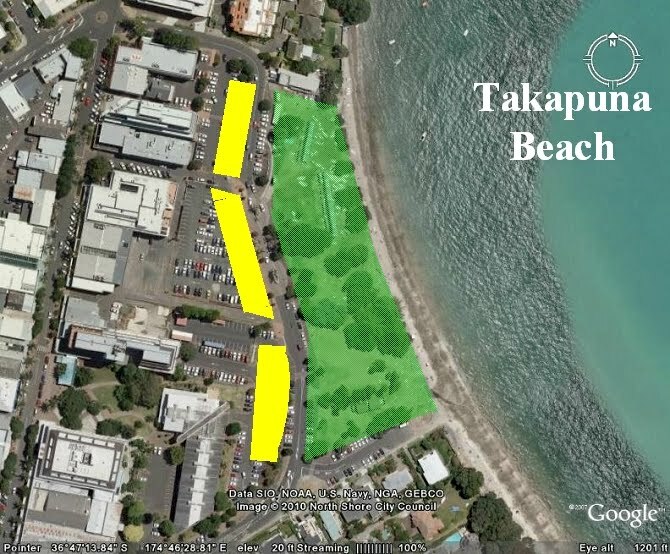 Key has to be turning Hurstmere Road inside out, using Council land holdings between it and the beach, so that Takapuna stops facing away from its beautiful beach and Rangitoto. Then its design potential will start to be realised. But this transformation will be frustrated if development is allowed with further blocks public access and sight of the beach, and if activities are permitted which detract from public use of the beach. Who is getting the Auckland Council jobs? My problem is how to get elected to Auckland Council, after serving time as an ARC Councillor and before that as a North Shore City Councillor. But that seems to be a relatively easy task compared to getting a job at Auckland Council - if you're already employed by a Council! Certain staff members out there are keeping careful count as appointments to the new Auckland Council and its CCOs are announced. 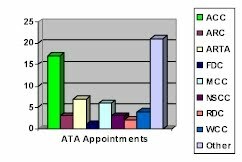 They provided me with this bar chart which shows where these new staff have been appointed from. Interestingly, the recorders of this information have included "Watercare" in the "Other" category. This probably reflects the widespread perception that Watercare and its supporters are exerting an undue influence in the design of the new Council structure, and also on who gets the key jobs. I will endeavour to keep this record up to date. ARC votes to combine Slug & Shed on QW! This blog is about the last 10 days of QW drama. I'd agreed to be silent while things progress, but now's the time for a blog. BTW at the end of this blog you will find a link to the Campbell Live look last night at QW. This is recommended viewing. But the main purpose of this blog is to provide an update on where things are at - as of 7th July. Today ARC held a short notice full council meeting. All the media were in attendance. 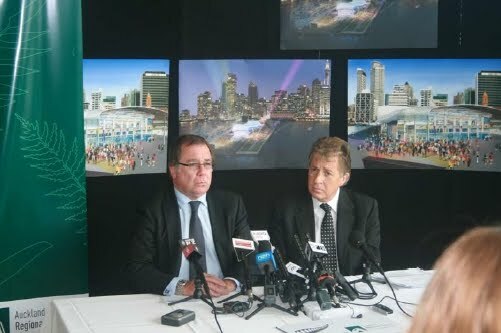 The purpose of the meeting was to present ARC's new designs, and also to acquaint the public with the fact that the Hon Murray McCully does not support the ARC's change of course. A rather odd resolution was passed without dissent. The guts of it is this: "...that recognising ARC's provisional agreement with NZ Historic Places Trust and the willingness of the Minister for the Rugby World Cup to explore options that retain Shed 10, the Council authorises the CEO to commission urgent work from the Council's architects on options that combine the retention of Shed 10 and the Minister's preferred temporary building..."
I asked at the meeting, rhetorically of course, "what do you get when you combine a heritage shed with a plastic slug?" Is it a shug...? or is it a sled....? It's a nonsense of course. Like the nonsense that drove the other compromise - the removal of Shed 11. The only reason it's gone - according to ARC's council report - is to "improve views", and to "create more public space". As if there's not already vast amounts of public space on this 27th ARC Regional Park. And as if we really need better views from QW of the Hilton Hotel on Princes Wharf. In fact I find the "improve views" reason hypocritical. How can you say that Shed 10 should be retained because it's heritage, and also say that Shed 11 (which is much the same externally and relates really well with Shed 10 - it's brother or sister if you like) should be removed because it's somehow not heritage, and the view we have had of it for the past 100 years should be replaced with a view we can see today with Shed 11 left where it is? Letters on the agenda from the Historical Places Trust state its assessment that: "...NZHPT's strong preference would have been for Shed 11 to remain in its original location, however under the circumstances we accept that relocation is possible...." and notes further that: "...we understand that one of the rationales for relocating Shed 11 is to enable views to be opened up from Queens Street to the Harbour...". This illustrates the depth of the compromises. The ARC Councillors first learned about this alternative design, and Mike Lee's change of heart toward Shed 10, through a confidential item on the council meeting agenda held last Monday 28th of June. Councillors were advised that his attitude about Shed 10 changed in the course of meetings held with the Historic Places Trust, some of which were attended by the Hon Murray McCully. It appears the Minister was forthright in expressing his view that the sheds should go, and make way for his preferred cloud structure, aka the slug. It also appears that the Minister was not for turning. ARC's Chairman was concerned that a divergence of views was emerging (between him and the Minister) and so he wrote to the PM about it on 17 June, putting a strong argument for the adaptive re-use of Shed 10. The Minister for the RWC replied to that letter on the 28th of June. Interesting that he replied, and not the PM. I can imagine the conversation about that. Something like, "you write the letter Murray, you're the Minister, but if you haven't got this sorted out in 10 days I'll have to put it back on the Cabinet agenda..."
Anyway, the letter goes, "...I was therefore surprised to read the correspondence between the ARC and the Historic Places Trust where you in effect reverse the agreement reached with the HPT on 27 April and develop an entirely new plan. That clearly goes much further than the obligation to consult over the agreed proposal and I am at a loss to understand how this could have occurred..."
The letter goes on state that: "the Government remains committed to the announced proposals..." This letter arrived on the day of the 28th June Council meeting, and Chairman Lee read it out to Councillors who were meeting informally before the Council meeting. They were concerned that this situation should not lead to a meltdown in relations. There were also suggestions that dialogue should be opened up between ARC and Auckland City Council, now that ARC's proposals involved retention of Shed 10 and its adaptive re-use. 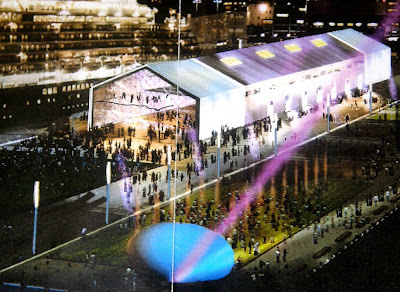 This type of approach was supported by Auckland City Council and budget had been set aside for Queens Wharf work on condition that its sheds were refurbished as part of that work. For completeness I note here that in April 2010 Auckland City Council's Combined Committee meeting voted for: "That the $21 million and $5 million capital expenditure budget for Queens Wharf in 2010/2011 and 2011/2012 be confirmed in the Annual Plan, subject to: These funds are only to be applied to a project that ensures the restoration/refurbishment of the sheds on Queens Wharf for the Rugby World Cup, and in the case of Shed 10 future medium term uses including the possible option of a cruise ship terminal." At the 28th June ARC meeting, councillors were given a stark choice. Either to vote for the previously agreed "Cloud" / "Slug" approach (which had been voted on, and supported by a majority, at the ARC's 19th April Confidential Council meeting), or to support the new direction (shown in these pictures). The council voted for the latter course of action, which was a change in direction. That was last Monday. But I digress. Then on Tuesday ARC councillors were advised there would be an extraordinary Council meeting about QW today (7th July). The rest is history. I have summarised the decision made, above. Another letter from Murray McCully, dated 6th July, accompanied the agenda. It restates that "Ministers have agreed that we remain committed to the decision Cabinet made on 19 April. 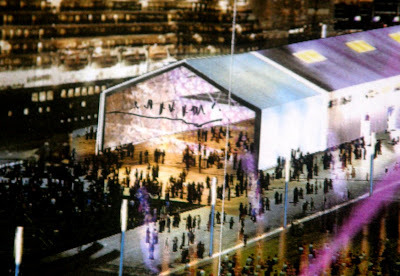 We see no merit in the redevelopment of Shed 10 on its current site, as we agree with your earlier assertion that it is 'old and cheap and nasty'..."
The letter goes on to offer two alternatives: (1) restore Shed 10 off the site and build the "cloud" as agreed; or (2) "we would be prepared to sell the Crown's share in Queens Wharf to the Auckland Regional council in order for you to pursue your alternative design..."
To finish this I will repeat the advice that was contained in the report to councillors at today's meeting. The advice stated: "In considering its position, the Council will have to weight up the relative importance of: the heritage values of the Sheds; the use of Queens Wharf as a fan zone for the Rugby World Cup; the costs to ratepayers and taxpayers of alternative options; the flexibility available for future decision makers; the value for money afforded by the alternative options; the feasibility and risks of each option; the council's relationship with Government; and the expectations of the people of Auckland." Auckland City Council and Auckland Regional Council need to sort this out together. It's about time this partnership worked. Auckland City can help ARC to buy the Government out, and then manage the Party Central fitout of the Queens Wharf sheds. Without precluding future. 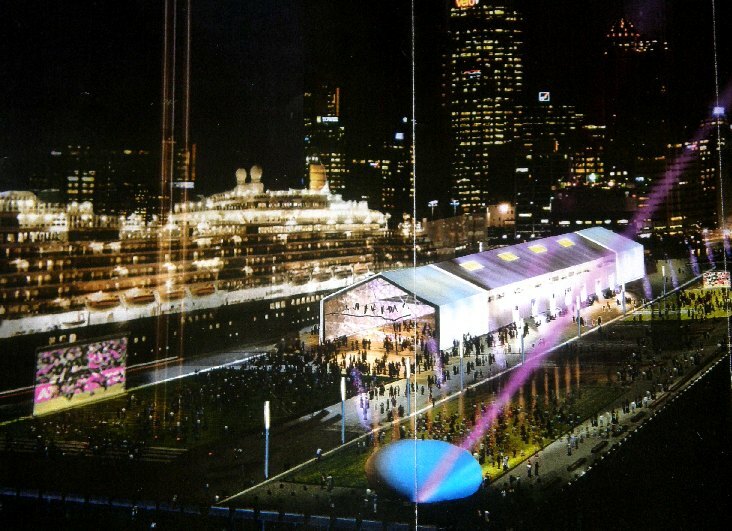 This is a revealing insight into ARC cruise shp terminal thinking.